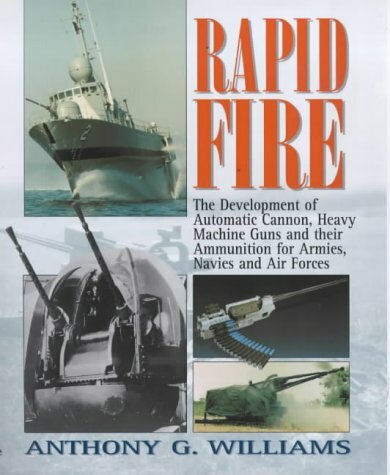 The purpose of this book is to describe the development of automatic weapons and ammunition which are larger than the usual rifle calibres. The majority of these have calibres of between 12.7 and 57mm, although reference will be made to some smaller and larger weapons for the sake of comparison. There is also a comprehensive summary of heavy shoulder-fired rifles – anti-tank weapons and their modern equivalents – in Appendix 1. The book assumes no prior knowledge of weapons and ammunition and there are no formulae. However, there is much that will interest the knowledgeable enthusiast as a result of research into primary sources, mainly at the Ministry of Defence Pattern Room in the UK, but also with contributions from other researchers around the World. It contains much information that has never been published before. The book will be a useful reference as the complete data tables and cartridge and weapon illustrations in the Appendices are unavailable in any other publication. However, it has been written with the aim of explaining and evaluating as well as merely describing. It is intended to be essential reading for anyone with an interest in the technical aspects of military history. It has 297 pages, 160 black & white photos, 32 pages of colour photos and around 30 pages of line drawings. A regularly-updated Rapid Fire update page for amendments and additional material obtained since publication. The Mauser M1918; British experiments and the .55" Boys; the 12.7mm Sholoklov and the 14.5mm PTRD and PTRS; the Czech 15mm vz 41; the US TE1E1 .60"
The metric calibre, rim and body diameters, country of origin/main use, projectile type/weight, muzzle velocity, muzzle energy and the principal weapon applications for 95 cartridges which have seen service. In some cases several different loadings are given. Similar information to Table 1 for 7 cartridges currently under development, 30 experimental/limited service rounds, 4 used in manually operated repeaters, 13 for shoulder-fired heavy weapons,11 rifle-calibre machine gun cartridges and 13 rounds for manually-loaded cannon, selected for comparative purposes. The name, metric calibre, weight, length, barrel length, method of operation, cartridge feed and rate of fire for about 200 different weapons which have seen service, grouped by nationality. Similar information to Table 3 for about 60 weapons which saw little or no service, or have completed development but not yet been officially adopted, or are still under development. The name, country of origin, metric calibre, weight, length, barrel length, method of operation and cartridge feed for 20 different anti-tank weapons which saw service, and 13 modern rifles firing 11.35-20mm ammunition. Information for comparative purposes on 28 weapons used in the 20th Century, including medium MGs, light MGs, GPMGs, aircraft guns and externally-powered guns. Drawings prepared by J-F Legendre of 94 different cartridges of calibres 11.35-57mm used in service automatic weapons. Includes such little-known items as the 24x138 and 34x239 Swiss cartridges , the 23x260mm for the Rikhter R-23, all of the 30mm, 37mm and 57mm Japanese aircraft gun rounds to see service, the 37x195 for the Soviet NS-37, the 50x346B for the FlaK 41 and both of the Bofors 57mm rounds (short and long case). Drawings prepared by A G Williams of 12 fighter aircraft guns of 20-37mm calibre introduced into service in the postwar era. Includes the Soviet NR-23, N-37, NR-30, GSh-23, GSh-6-23 and GSh-301, the US 20mm Mk 12, M39 and M61 and the European Aden/DEFA, Oerlikon KCA and Mauser BK 27. Includes comprehensive cross-referencing to facilitate browsing.